*There is a $25 fee for all televisions and a $10 fee for non flat screen computer monitors. These fees do not cover the entire expense of recycling these materials, but help defray costs so we can continue accepting these items. Unfortunately, we are unable to accept rear projection televisions. **Desktop printers and fax machines have a $5 disposal fee per item. Large office copiers also accepted for disposal at a per pound rate. 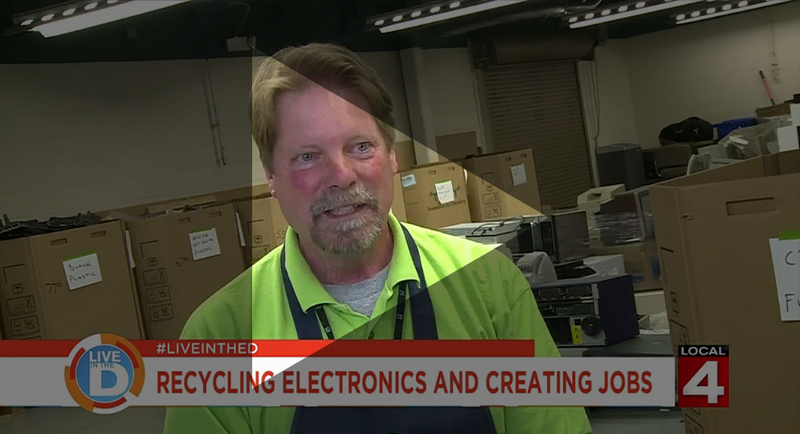 eCycle Opportunities helps people recycle their lives as all proceeds from the program are recycled back to our services to support people with disabilities. eCycle Opportunities also provides work opportunities to people with disabilities, empowering them to realize life’s potential. Look for the eCycle logo on the south door and ring the bell. *Appointments also available. Contact us at (248) 233-4477 or info@ecycleopps.org to schedule an appointment. For additional information, or to schedule a recycling event at your business, workplace, school or other location, contact us at (248) 233-4477 or info@ecycleopps.org.